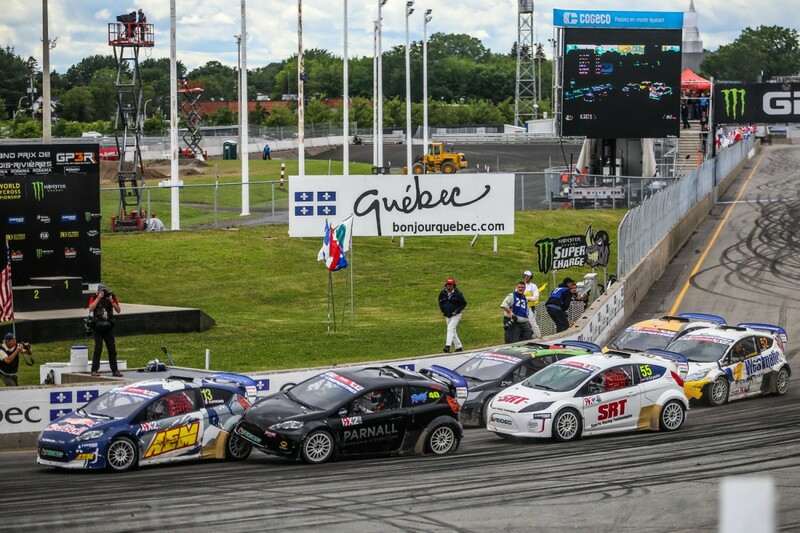 Two years on from his debut in the FIA World Rallycross Championship feeder series, Cyril Raymond returned to the Grand Prix de Trois-Rivières in Canada this weekend (5/6 August) and delivered a masterclass to close in on the coveted crown in the RX2 International Series presented by Cooper Tires. Throughout the qualifying and semi-final stages, the scene looked set for a battle royale between Raymond and his chief title rival Dan Rooke, but the Englishman found himself out-of-luck in the all-important final, as a first corner error dropped him to fourth and a subsequent three-way collision saw his challenge end in the wall. At the time of his retirement, however, Rooke was already trailing Guillaume De Ridder and Tanner Whitten, who duly completed the podium positions behind Raymond – the Belgian in particular proving to be one of the stars of the weekend, winning three of his four qualifying races as he continues to prove his prowess in the burgeoning discipline. The qualifying races saw mixed conditions, with heavy rain at times making for a distinctly treacherous track surface. Raymond and Rooke shared the fastest times to jointly top the table after Q4, painting the prospect of a tantalising duel ahead between the two championship protagonists. Raymond’s Olsbergs MSE team-mate Whitten was a consistent contender in third, with Vasiliy Gryazin enjoying his best RX2 event to-date in fourth, as the Russian produced an impressive turn-of-speed on Canadian soil. After shining in both the wet and the dry, De Ridder should have been inside the top three, but an engine issue at the start of Q4 dropped him to fifth in the intermediate standings – just ahead of his JC Raceteknik stablemates Sondre Evjen and William Nilsson in sixth and seventh respectively. 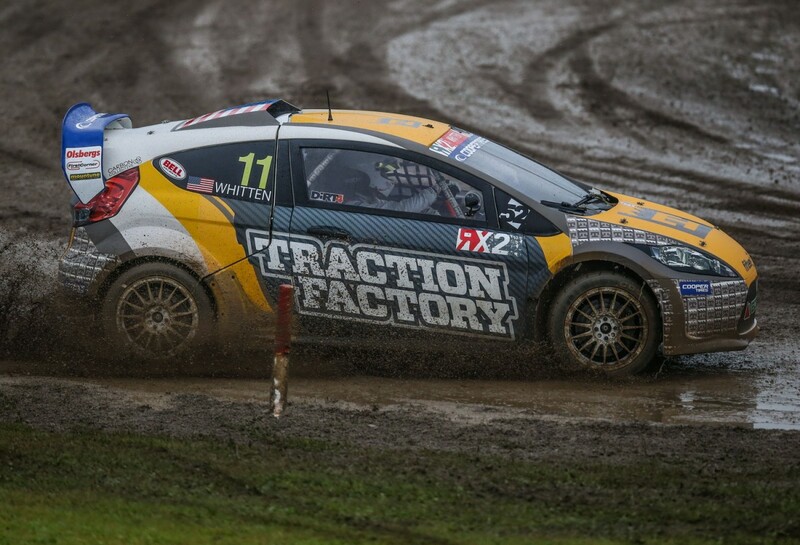 Simon Olofsson overcame a series of scares and close calls throughout the qualifying stages to snare eighth place, with Andreas Bäckman in ninth and Sandra Hultgren and Jessica Bäckman both making it into the semi-finals for the first time this year in tenth and 11th. Series newcomer Cole Keatts rounded out the top 12 on his RX2 debut, although there were hard luck stories for Norwegian trio Glenn Haug, Simon Syversen and Thomas Holmen, with the latter encountering all manner of mechanical maladies before posting the third-quickest time in Q4 to demonstrate what might have been. From pole position in the first semi-final, Raymond got the jump at the start over Whitten, but a challenge from De Ridder backfired as the Belgian locked up and overshot the first corner, slipping to sixth in the process – although he rapidly regained fifth from JC Raceteknik team-mate Nilsson. With Raymond and Whitten holding station throughout, attentions switched to the developing tussle for third between Andreas Bäckman and the recovering De Ridder, who dived to the inside on the last lap, with contact pitching the Swede into the barriers. 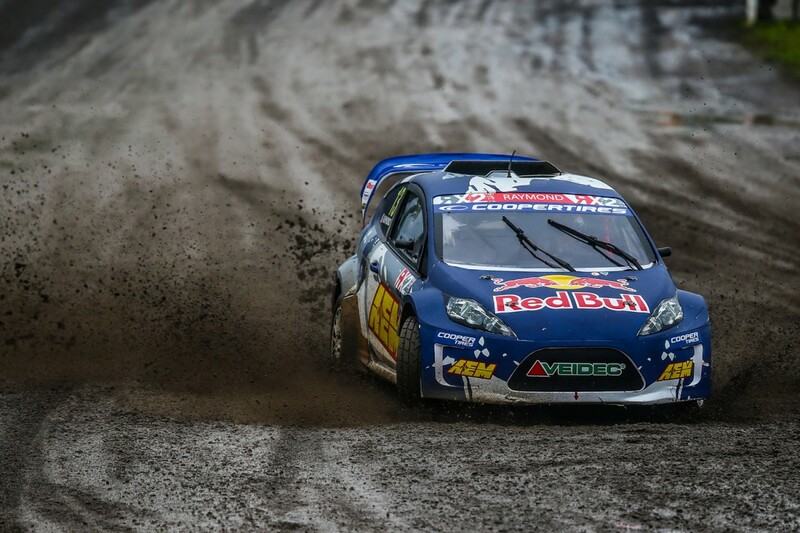 Jessica Bäckman completed her first RX2 semi-final in fourth place, with Nilsson fifth. Rooke led Gryazin away from the lights in semi-final two, with the fast-starting Olofsson leaping immediately up to third, as Evjen and Hultgren played early jokers. 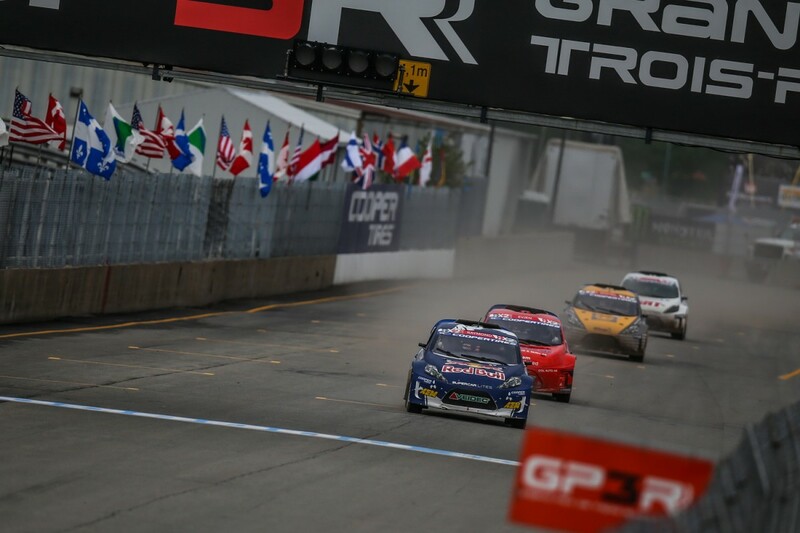 The leading trio pulled away from the pursuing pack, with Rooke inching clear and Olofsson pressurising Gryazin for second until the Swede found himself falling back slightly in the closing stages with brake issues. Rooke motored on to win and book his place in the final for the fifth consecutive event, with Gryazin joining the Englishman for the first time in second and Olofsson narrowly staving off Evjen for third. With the two title protagonists sharing the front row of the grid for the final, tensions were high – and when the lights went out, Raymond and Rooke made almost identical getaways. Something had to give, and as the Frenchman hugged the inside line, it was his British rival who lost out on the exit as he slipped behind De Ridder and Whitten. 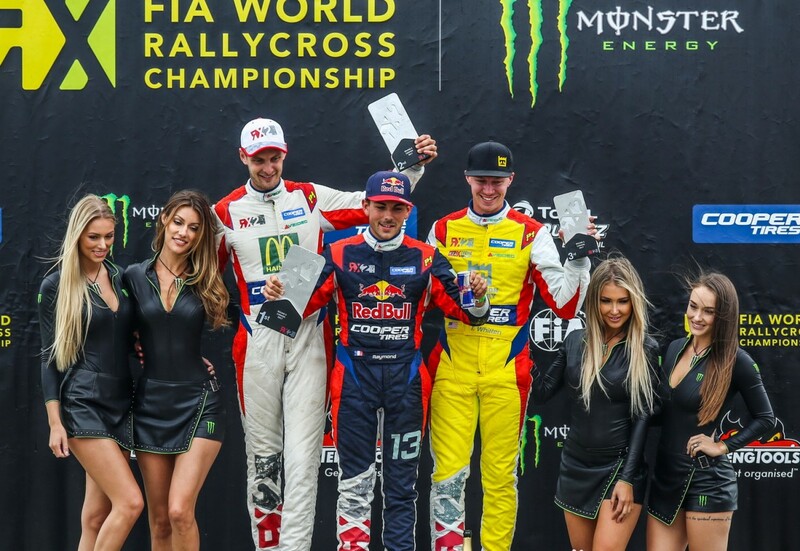 The reigning MSA British Rallycross Champion took the opportunity to joker on the first lap, but De Ridder and Whitten had enough pace to stay ahead after their own jokers later on – which is where things really heated up. With Raymond cruising on to victory, the De Ridder-Whitten-Rooke scrap came upon Gryazin, who was yet to joker and struggling with engine issues. As De Ridder found himself momentarily baulked, both Whitten and Rooke scented an opportunity to pounce, and it was the Englishman that came off worse as an ambitious move on the outside line ended in the concrete wall. He was attempting to rejoin when he was hit by an unsighted Olofsson, bringing his race to a premature conclusion. All of that was of little concern to Raymond, who swept serenely to his fourth triumph from five outings in 2017 by a margin of almost seven seconds, seeing the Frenchman extend his championship lead over Rooke to 14 points heading next to his home round at Lohéac on 1-3 September. De Ridder replicated his breakthrough Swedish result in second, with Whitten returning to the podium in third. Gryazin took fourth ahead of the delayed Olofsson.